Sunflow Roofing is a full service roofing company that installs and repairs shingle roofs for residential, and commercial applications. SunFlow Roofing came to us looking to dramatically increase sales and differentiate their brand from the “Classic Roofer” in the mind of local consumers. With the help from Suits Social, they were able to fulfill their needs and convert 21 new leads who requested a quote. Diffrentiate from the "classic roofer"
Suits Social developed and managed a social media ad strategy with 4 custom Paid Social Media Ad campaigns, designed to increase new sales, while differentiating their brand from the “Classic Roofer” in the mind of local consumers. In approximately 2 weeks we generated 21 qualified leads who requested a quote, which ultimately lead to an estimated $40,000 in gross sales. Consider that SunFlow’s lead/sale conversion rate is about 30% and the average sale is worth between $6,000 - $8,000 each. 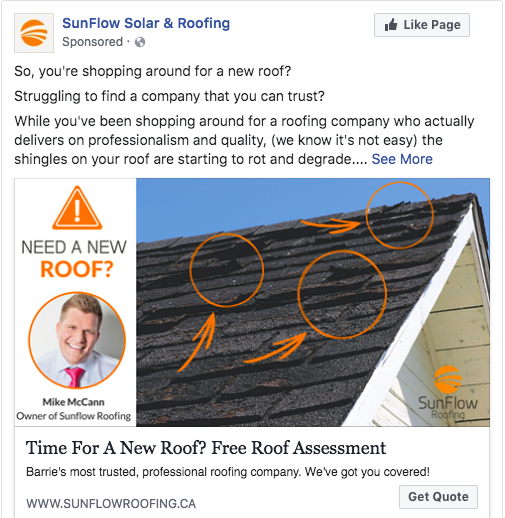 We worked with SunFlow Roofing to create content that people would recognize...Mike's Face! Here is an example of an ad we used to target home owners with a free roof assessment. With this ad, we aimed to give the audience a visual of the owner, Mike McCann. People in Barrie recognize Mike from SunFlow Roofing's radio ads and videos he posts on Facebook. We decided to put his face beside a visual of a roof that needs to be re-done, with the question "Time for a new roof?" By clicking "Learn More" the customer is taken to a form where they must fill out their name, number, and email to receive a call to make an appointment. We are still partners with SunFlow Roofing and we are working together to generate more leads and bring in new customers.